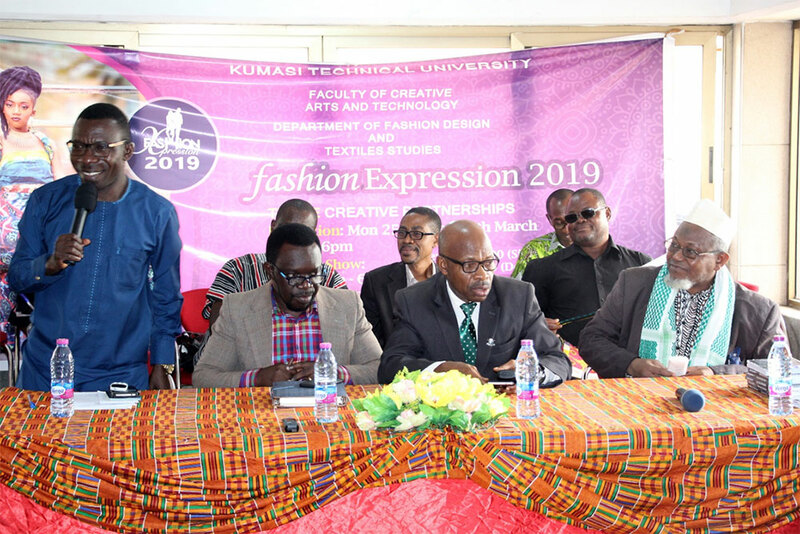 The annual fashion show of the Faculty of Creative Arts and Technology (FCAT) of the Kumasi Technical University has been duly launched under the theme ‘Creative Partnerships’. The annual programme which has become part and parcel of the FCAT’s events for the year is always eagerly anticipated by students and numerous patrons from the general public. The event seeks to celebrate the creativity of students as well as encourage them in their entrepreneurial drive. In the opening speech of the Dean of FCAT Rev. Dr. Timothy Crentsil, he intimated that the creative industry is a multibillion-dollar industry when harnessed to its fullest. He said those who are serious with it have succeeded and continue to reap it associated benefits. He appealed to the government to set up galleries and theatres which will help boost the creative industry. He used the opportunity to praise the students for working in teams and partnerships to bring out such creative designs. Diana Gyamfi, the Industrial Promotions Officer from the Ministry of Trade and Industry commended the University for sustaining the programme and by so doing, created an avenue for students to exhibit their creative abilities. She outlined certain policies that the government had initiated that are aimed at protecting the garment and textile industry. According to her, they include the recently held ‘Made in Ghana’ fair and the creation of the ‘Made in Ghana logo’. The Ministry she promised was ready to support and collaborate with the Faculty. The Interim Vice Chancellor Ing. Prof. Mike A. Acheampong commended the Dean and staff of the Faculty for the great work in organising the programme. He further tasked the Dean to introduce other programmes in order for the Faculty to maintain its position as one of the pivots of the University. Other dignitaries who attended the lauch included the Acting Registrar of the University Mr. Abraham Annan Adjei, the Head of the Fashion department Dr. M. Obeng Nyarko and a former Dean of the Faculty Prof. S. Kpeligah as well as other key officers of the University.